A gem. There’s really no other word to describe this Flash cover than that. It’s got Carmine Infantino and Murphy Anderson illustrating the Flash in motion like no one has before or since as he tries to stop an atomic bomb rocketing down through the logo belching hot (and probably radioactive) smoke about to incinerate a city on a pristine cloudless day. That my fellow Flashinados is what a comic book cover is all about. And, on top of that, it’s beautiful. Marvel may have been coming on like gangbusters in 1964, but, as cool as their comics were starting to become, I doubt that at that point in time you would have said any of their covers were beautiful. Energetic and attention grabbing for sure, but beautiful… not so much. This Flash cover exemplifies the DC house style in all of its glory. Speaking of Marvel, the story inside opens with an escaped con who wanders onto a nuclear test site just as an atomic bomb is about to go off. He’s hiding in a cave when the bomb goes off and the effects of the radiation and unleashed chemicals in the earth cause his body to mutate. All together now… “Gee, isn’t that the same origin that appeared two years earlier in the Incredible Hulk?” I mean, from comic books very beginnings, its tropes were practically considered public domain, but geewillikers… make an effort, huh? Anyway, the escaped con, Luke Elrod, now has the ability to change himself in to anything he wants animal, vegetable mineral or atomic. 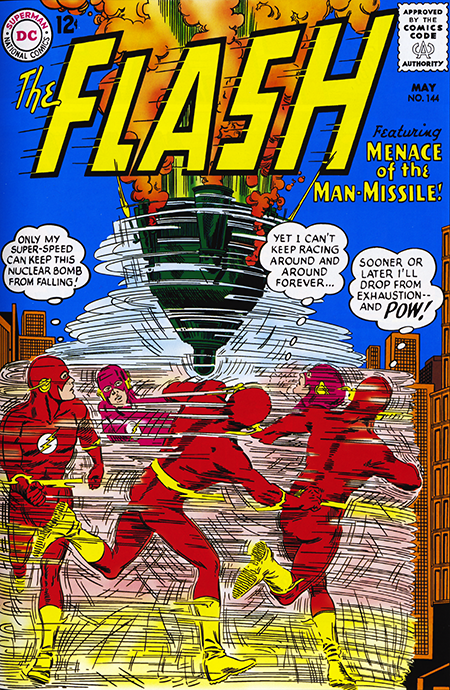 Over the course of the story he turns himself into tree roots, a jackhammer, Barry Allen, water, a bag of jewels, a piece of paper, a small airplane, and finally a guided missile with and atomic warhead designed to seek out the Flash, which the Flash lures to vast wasteland on the outskirts of Central City (huh? again) where it detonates because the Flash turns himself back into Barry Allen and the bomb doesn’t know what to do. Now readers of this blog know that I have all the respect in the world for Gardner Fox, but every now and then we all come up with a silly story. Fox’s mistake was that he wrote this one down. He made up for it though in the Kid Flash story that followed where he dropped one of those cool Flash scientific facts on us like the fact that cellophane when packed tightly enough and set afire… will explode. That’s pretty cool to know. I never tried it, but, who knows? There’s still time. One sad note about this issue is that at the end of the lettercol, it was announced that the Elongated Man would be leaving the Flash and moving to a back-up slot in Detective Comics. Elongated Man, we hardly knew ye. On another page at the back of the mag we saw an ad for the next issue of Mystery in Space with Adam Strange on the cover little realizing that this would be the last Schwartz edited, Infantino drawn, Anderson/Giella inked and Fox written issue with that character. This was all happening because Schwartz and team would be moving over to Detective Comics to attempt to revive the moribund Batman franchise, and, as a result, the Elongated Man and Adam Strange would be sacrificed in the abattoir of clueless managerial dictates. To song-check Bobby, the times were definitely a changin’.